Seattle Slew's performance in the 1977 Flamingo Stakes is uniformly recognized as one of the most dominating showcases ever put forth by a thoroughbred racehorse. The visual display of superiority on that early spring afternoon was spectacular. Perhaps the most impressive aspect of the race was the manner in which Slew toyed with the field. Many observers came away with the opinion that Slew thought he was simply out for a morning workout. The biggest differences in the Flamingo in comparison to Slew's previous races was the longer distance of 9 furlongs and the fact that the race would be run around two turns. The hope that this would present difficulties for Slew was a main reason why the connections of 12 other colts decided to enter. Considering Slew's whirlwind performance in his prior victory, it was very surprising that a dozen would test the Champion. But hope springs eternal in the thoroughbred world, and several improving thoroughbreds lined up in the gate next to Seattle Slew on the afternoon of March 26. By the time the flag went up they had all felt the chill of Slew's intimidating presence, and seemed to understand that they were competing for second-place money. Seattle Slew's dynamic behavior in the paddock and throughout the post-parade had left no doubts as to the star of the show. A few minutes earlier while the horses were in the walking ring, the owner of Ruthie's Native, Nathan Perlmutter, and his trainer, Gene Jacobs, were surveying the situation. "I've never seen this before," observed Perlmutter. "The second choice is 7-1." "Everybody ought to be in the mutuel field," Jacobs commented. "It's all of us against the big horse. That's the way they used to do it in the old days when bookmaking was legal - 'Seattle Slew against the field.' "
As trainer Billy Turner looked on, he thought about his meetings with jockey Jean Cruguet earlier in the day and their discussions about various scenarios that may unfold. He was confident of victory but concerned that Seattle Slew would run too fast. He recalled one of his morning statements to the press, in which he once again expressed his wishes to have Seattle Slew do "less" than his ability and competitiveness would normally manifest. "I'd love to look up and see 1:36 (for the mile) and 1:48 (for the 1 1/8 miles), but I don't expect it," Turner had said. "He's probably going to go 1:34 and 1:46. They don't sit back and wait on you for $100,000." As Slew danced around in the post-parade, Turner shook his head in awe of the intelligence of the colt. He knew that Slew had recognized what was coming up next and that it was time to show that he was the king of the racetrack. It was the same in the mornings or whenever Slew realized he was going to get to do what he loved. A few days before the Flamingo, Turner spoke about those mornings and of training Seattle Slew. "We don't have a precise work schedule for this horse," Turner said. "We send him out early, but what he does depends on how he acts, how much control the boy seems to have of him. I've only worked him 15 times and never more than three-quarters. He always wants to do too much. You're always hoping for something less. I hate to send him out with a pony in the afternoons, but there's the fear he'll run off (if I don't). "I always hoped to have a good horse, and I studied Ruffian so that when and if I did get a runner, I'd be able to make the right decision once in a while," said Turner, still in awe of the brilliant filly. "I think Frank Whiteley was terrified every time he worked her. She was a whirlwind. He'd have Dave on a pony 3/16 down from the wire, and a pony boy a quarter-mile down, just in case the boy couldn't get her pulled up. I think Ruffian accomplished more off less work than any horse I ever saw. She was so free running, just a beautiful filly. I guess there is a parallel with Slew. He's so strong it scares you." Turner's comments that day were fitting. 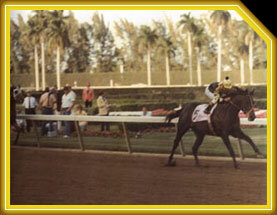 Seattle Slew and Ruffian were both big and powerful equines with similar physical characteristics and running styles. Watching Ruffian roar down the stretch with her glistening, nearly black coat was like watching a female complement to Seattle Slew. One can only imagine the brilliance that would have been produced if fate had allowed the two champions to be mated together. As the horses finished their warm-up routines and post time for the Flamingo Stakes drew near, Seattle Slew remained on his toes. He loaded into the number 4 slot in the gate and was ready to go. The odds-on favorite in the 13-horse field, Seattle Slew broke smartly but was beaten to the lead by Wine Treasure, who had a head in front for several strides. Approaching the first turn Slew took the lead while racing three paths from the rail. Ruthie's Native, breaking from post 10, rushed up in an attempt to cross over and was taken wide around the first turn, but still managed to straighten out and gain fourth place. Jatski had settled into third position. Slew changed leads effortlessly on the first turn and led by a length and a half after a quarter-mile in :22 2/5. Along the backstretch Slew rolled along with a half-mile in :45 1/5 and a two-length advantage over Wine Treasure, Ruthie's Native, and Jatski. Approaching the far turn, Slew changed leads again and exploded away from the field increasing his lead to roughly a dozen lengths by the time he approached the top of the stretch. He had gone six furlongs in 1:09, only two-fifths of a second slower than the existing Hialeah track mark for a race of that distance. He changed leads once more at the top of the stretch but this time Cruguet rejected Slew's attempt to surge forward again by taking a hard hold of his reigns and began the process of slowing him down. As they straightened out in the stretch, Cruguet turned and looked back over his right shoulder to gauge the proximity of the challengers. He saw that Giboulee and Fort Prevel had taken over the second and third positions. Giboulee was moving along the rail in an attempt to make up ground but Cruguet was not concerned and he continued to ease Slew. Slew had completed a mile in 1:34, which was 2 3/5 seconds faster than the existing Hialeah mile record set in 1942. Cruguet continued the easing and Seattle Slew completed the race with a 4-length victory in 1:47 2/5. Though he was restrained considerably, Slew still recorded the third-fastest time in the forty-eight-year history of the race. Seattle Slew had emphatically dominated a fine group of colts. Second-place finisher Giboulee was a stakes winner at the ages of 2, 3, and 4 and Canadian champion handicap horse at age 4. The son of Northern Dancer excelled around two turns, winning six stakes and placing in nine others. In 1977 alone, he won the Lexington Stakes, Plate Stakes Trial, and Manitoba Derby, was second in the Flamingo, and third in the 1977 Queen's Plate Stakes and Prince Of Wales Stakes. Other talented colts that Slew bested included Jatski, winner of the 1977 Travers Stakes, Ruthie's Native, winner of the 1977 Fountain Of Youth Stakes and the 1977 Tropical Park Derby, Coined Silver, winner of the 1977 Florida Derby, and Iron Constitution, winner of the 1977 Withers Stakes and runner-up in the 1977 Preakness Stakes. Afterwards, Turner could not hold back the tears as he waited to walk back to the detention barn with Seattle Slew. "I'm awfully lucky to have a horse like this," he said. "He turned a corner today (going 1 1/8 miles), and he did it without taking too much out of himself. Jean rode him perfectly. He's still awfully green; he is going to get better with seasoning." Cruguet was asked if Seattle Slew had gotten tired the last eighth-mile. "How could he?" Cruguet countered. "I never asked him to really run. He could have gone much faster." The aura surrounding Seattle Slew was even enveloping members of the racing industry. "People don't get emotionally involved with racehorses as a rule," said Hialeah clocker Ted Tamer after the race, "but with this horse you can't help it. If I had another 3-year old colt right now, I'd try to beat Seattle Slew - but only to the airport to get on a plane." On June 19, 2004, Seattle Slew's owners Karen and Mickey Taylor recalled the excitement of the Flamingo Stakes with fondness. "Slew loved Hialeah," Mickey Taylor noted. "Billy had him out from 6 a.m. to 7:30 a.m. every day. He galloped a lot, and we tried to work on relaxing him. Jean was amazed at the way Slew would be moving along quickly in a work and then change leads and take off like a rocket. For the Flamingo Billy told Jean, 'When he changes leads on the turns let him go for a while. Let's see what he does.' Well, for the lead change on the far turn Jean did just that and Slew exploded away. Then when he looked over his shoulder and saw the big margin at the top of the stretch and felt another changing of leads he said, 'Sorry, but it's time to slow down.' If we had given the green light to break a record, I think Slew would've broken the track record easily and perhaps the world record. "I still get chills up and down my spine when I watch the race and see Slew opening up around the far turn." Karen Taylor was very happy with Hialeah Race Course for several reasons. "Slew performed so well at Hialeah," she explained. "And I always felt that it was such a safe track. The surface always seemed in perfect condition. I think it's a shame that such a wonderful track had to close its doors. It was also a great place to relax a horse around the barn. "I was overjoyed with the outcome of the race. We always tried to look after the horse. In our minds and hearts, that was the thing to do. Track records weren't a priority. I think the Flamingo makes that obvious." Longer races were still to come, but Seattle Slew would first have to master another two-turn 1 1/8th mile race at an unfamiliar and very different track in New York to remain unbeaten on the road to the Triple Crown. But for the time being, the Slew Crew would savor a spectacular victory that will long be remembered in the annals of racing history.